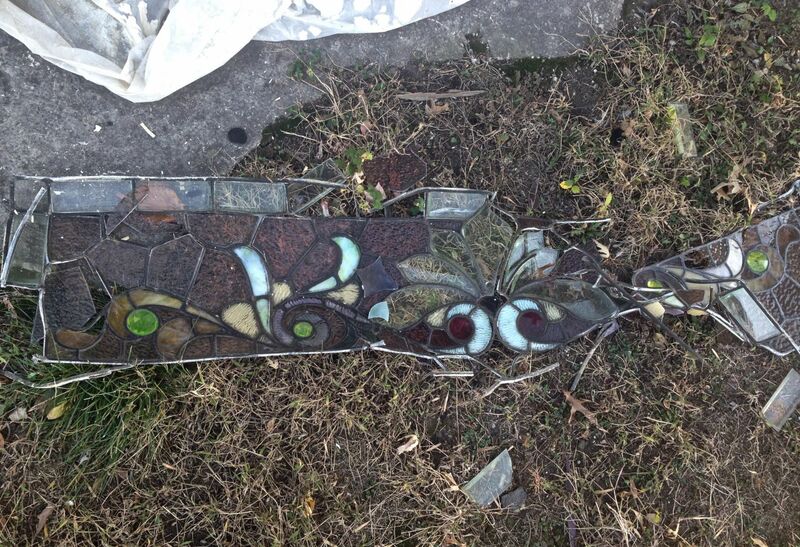 Last November I did a post about a suicidal stained-glass window in the Cross House, which had leapt to its death, and landed on the ground in a crumpled, shocking, and sickening heap. 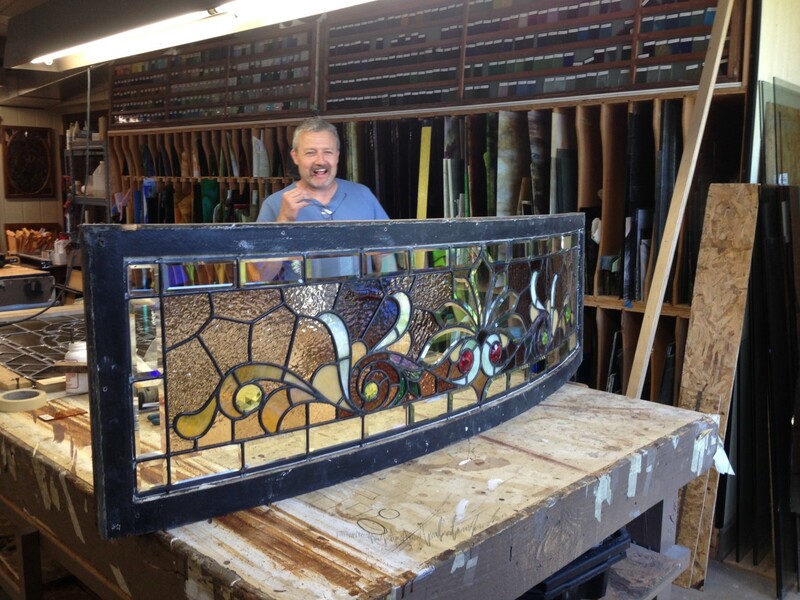 Yesterday, I picked up the resurrected window from Hoefer Stained Glass. INCREDIBLE. This makes my heart soar! About 80% of the glass is original. Proud wizard of glass, Scott Hoefer. There are two adjacent windows. All three are from the receiving room. About 95% of the glass is original. 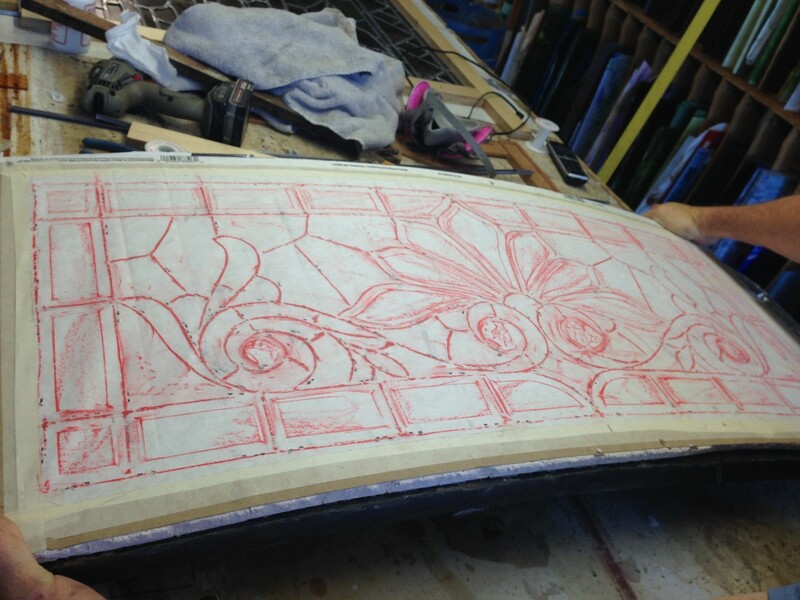 To restore a window, a trace is first made. 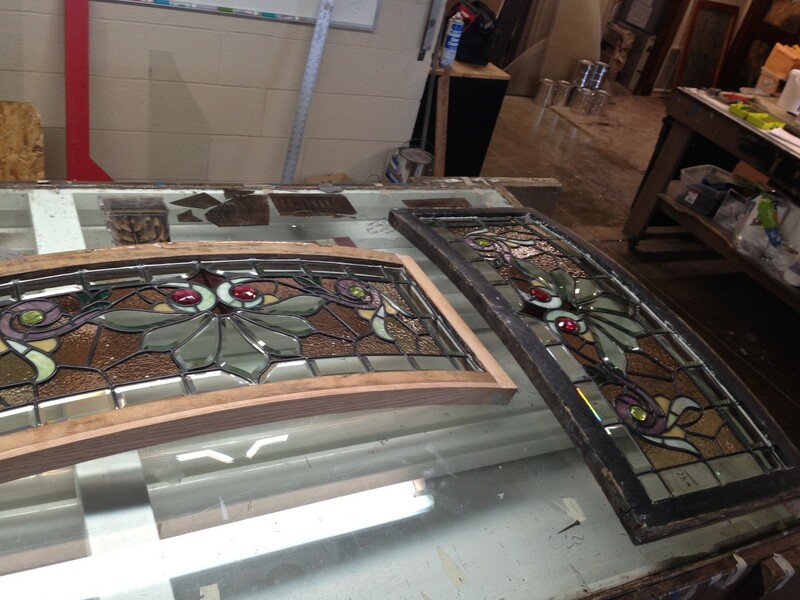 Then the window is taken apart, all the glass cleaned, and then all is put back together again with new lead caming. Curved windows are harder. The trace is taped to a piece of sheetrock, which is scored behind with parallel lines. This allows the sheetrock to form to the curve of the window sash. 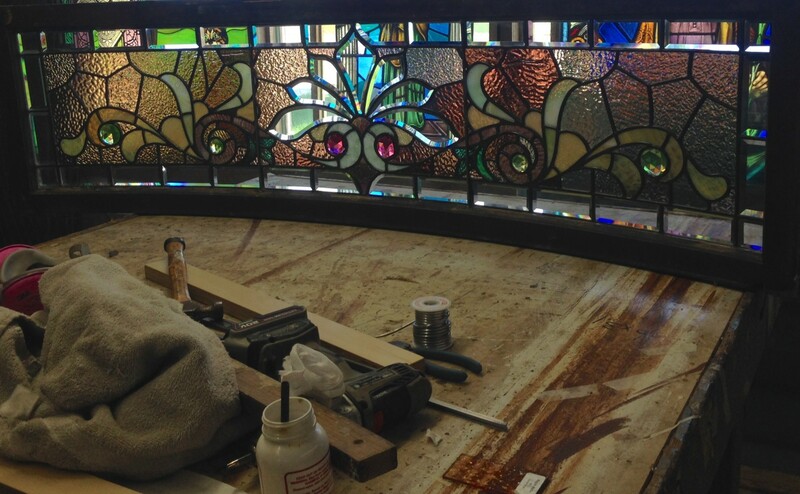 The receiving room set went into my van, and then I dropped off four stained-glass panels from the hexagon bedroom. These panels were very fragile, and I felt they could wait no longer. They are easy to remove from the outside, because of the main porch. I just stand on the porch roof with a ladder! In this image, the right panel is out. You can see the pieces of glass which fell away as I removed the panel. Terrifying. I caught them all, luckily. One panel though, as I had it in my hands, and was standing on the ladder, split in two. I FREAKED OUT. Small pieces instantly started falling away. I instinctively grabbed at the panel like one would a baby falling, just pulled everything tight to my chest, and with both arms tightly under the panel. And…not a piece fell to the roof. All the while the sun was blazing on my bald head, and sweat ran in rivulets down my skin. When the four panels were out, I felt as though I had aged ten years. I gave up on the rest of the work for the afternoon, and dashed home. I was so traumatized that I did not even think to take an image of the pile-o-glass. That’s part of the Kansas motto, Ross. “Duct tape an’ bailin’ wire” (wire rhymes with flour)! OMG! I would have freaked out too! Wow. Smart you to instinctively know to clutch everything tight to your chest…..when I replay this in my head I fear that my response would have been to freeze and not clutch. No wonder you were traumatized and went home for the rest of the day – GEESH!!! I have shared residual trauma up here in northern MN at this latest adventure of yours. As to the “oh” part of your sharing – I couldn’t help it – I bwahahalaughed out loud – OMG – who would have thought to duct tape the damn panels together before removing them? Duh – anyone with any sense, it seems. Sigh. I would never have thought to do so either, but in hindsight, it is a simple & brilliant approach. Scott’s calm response slays me – live & learn, right Ross? Wow. Thanks for teaching me. 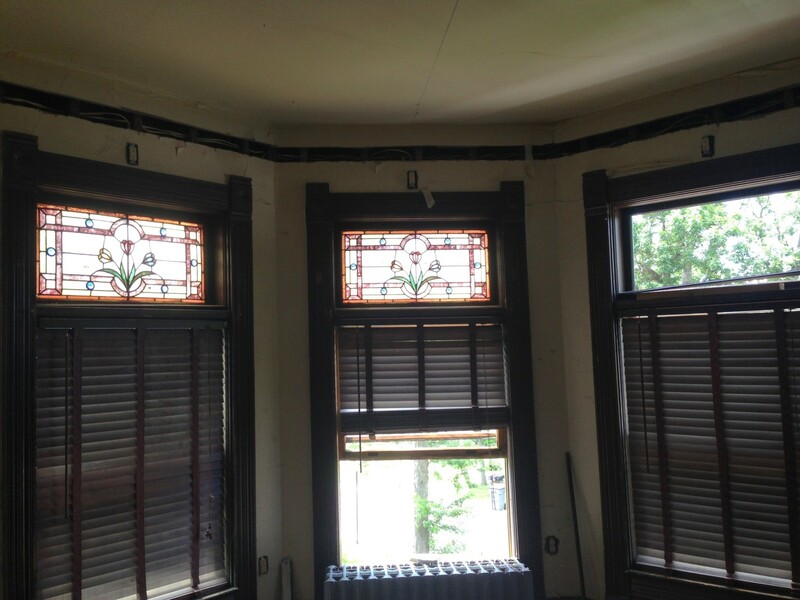 And – the windows are GORGEOUS – just GORGEOUS. What a beautiful job. The windows look beautiful, Ross. Did you ever find out about the missing screen doors? No. It’s all still quite the mystery! The restored window is splendid. I guess now you know how to take out the rest that need doing. Yes. 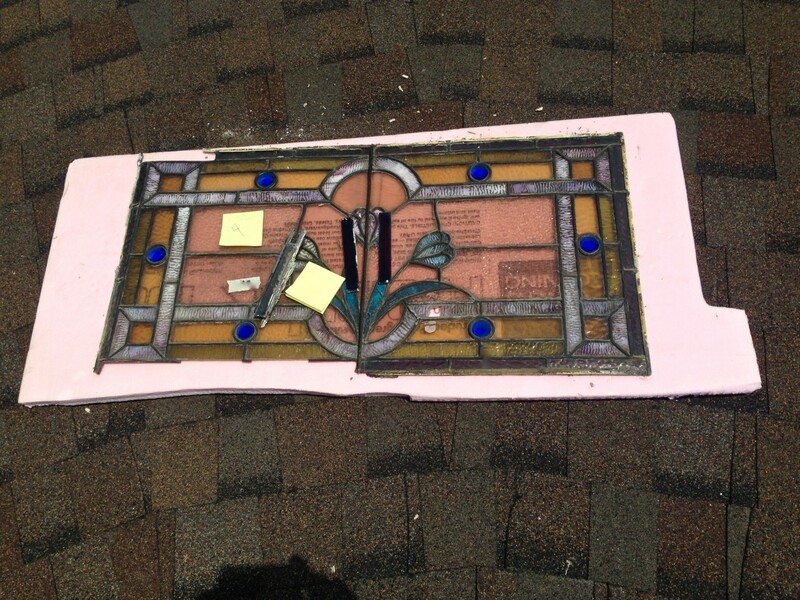 NEVER take out the stained-glass. ALWAYS instead take out the window frame!